On the way back from an amazing sea kayaking trip we were already planning the forthcoming bank holiday. 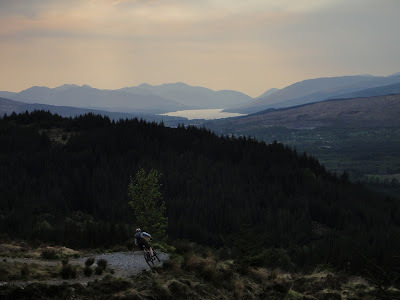 The plan was to head for the Ardverikie Estate to mountain bike in its majestic scenery. The weather forecast was looking good! We headed for Fort William to stay at Glen Nevis, this meant a sneaky evening ride around the XC World Cup course at Leanachan Forest. As huge Monarch of the Glen fans we had looked enviously at Glenbogle from across Loch Laggan so were very excited to be riding actually on the estate! We parked in a layby just down from the gatehouse. The ride was circular taking in the best the estate had to offer. Leaving the gatehouse we turned left off the main estate road heading for Loch Pattack. The scenery just kept getting better and better. The riding was a mixture of well made estate roads to land rover tracks that were seldom used. As we got closer to Loch Pattack the track became boggier but the riding was still quite easy going. We decided to have lunch at Loch Pattack as it offered a fantastic vista! It was also a respite before the climbing started. We planned to ride a circuit around Ben Alder the next day so we were working out the route which came close to Loch Pattack. We rounded the loch to a great little suspension bridge across the Allt a Chaoil- reidhe that was guarded by wild horses! The track then climbs gradually before it is time to ford the Allt Cam and the serious climbing then begins. The climb is 3.25km and climbs above the south side of Loch a Bhealaich Leamhain. There are sections of hike a bike and the scenery is truly intimidating! The view from the high point off the ridge of Beinn a Chlachair is spectacular in every direction. The descent down the other side towards Lochan na h-Earba was varied with great rocky singletrack. At the end of the descent we arrived at Lochan na h- Earba. We were scene spotting from Monarch of the Glen all the way down. We rode the eastern shore on a land rover track admiring the ongoing amazing scenery and getting excited about the impending view of Glen Bogle itself! And then it appeared. The driveway to the house! We posed for pictures and admired the amazing view of the house. We continued to pick up the estate road to ride the last section to the beach. We rode the beach to the end picking our way back to the estate road and back to the camper. The ride had been one of the most spectacular we had ever done! We will definitely be back! We were to stay the night at Glen Truim and Invernahavon campsite before heading to Dalwhinnie for the next ride. As 5 of us are due there to do the exact same ride on June 2nd ...its good to get a preview of what to expect! I just hope we get the same weather. We have had some great days mountain biking in Scotland. When the weather is great we wouldn't want to be anywhere else! Hope you have a great trip!! This route is usually done in reverse, either starting from Culra or Dalwhinnie. Amongst scenery like this I don't think it would make much difference the direction of travel! We were following the Vertebrae Scottish Mountain Bike Guide which suggested this way around. But thanks for the tip!